Ponds Built Right, Customers Served Right! "Our experience with the entire staff of The Pond Gnome was so positive. Paul talked us through what we could expect our water feature to look like and the written contract contained all items that we spoke about. No deletions or surprises. The construction crew arrived on time each day, were prepared with the necessary materials and always stated what they were to do on that day. Any questions or concerns that we had were addressed to our satisfaction. At the end of each day they cleaned up and prepared for the next day of construction. They were professional, efficient and perfectionistic. Especially the person who we dubbed the 'rock whisperer!' (Roy) We would highly recommend this company." "I love my new turtle and fish pond! Even though my project was small, Paul made sure it looked totally charming. For a year, my “pond” consisted of a kiddie pool and unattractive filter system. I spent a lot of time taking care of it. I know Roady, my turtle, and her fish friends are so much happier and so am I!!!" "I love my pond! Better than therapy! 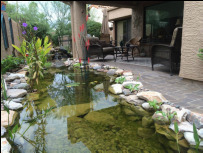 Nothing like sitting by the pond, feeding the fish and getting in the pond to clean it is truly rewarding!" "Pond Gnome installed our pond 12 years ago. We were pleased then and have enjoyed it ever since. Their quality of service is excellent. We recommend them highly." "The work was done quickly and professionally with the final results being amazing. They listened to our ideas and pictures to provide us with a detailed plan of what to expect and the cost. The guys were friendly, efficient, and skilled. First-rate craftsmanship with incredible results. You pay for quality, but I would consider this a bargain. True craftsmen, the Pond Gnome will help take your yard over the top with a beautiful water feature and a good price. 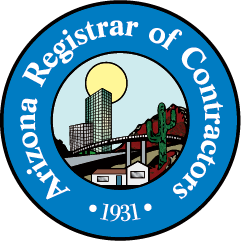 The company is professional, efficient, and kept us in the loop through the whole process." Clint Smith, clintmsmith@hotmail.com. "Just a great experience with The Pond Gnome. 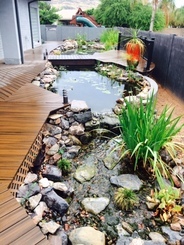 We get loads of praise about our pond from every home visitor."